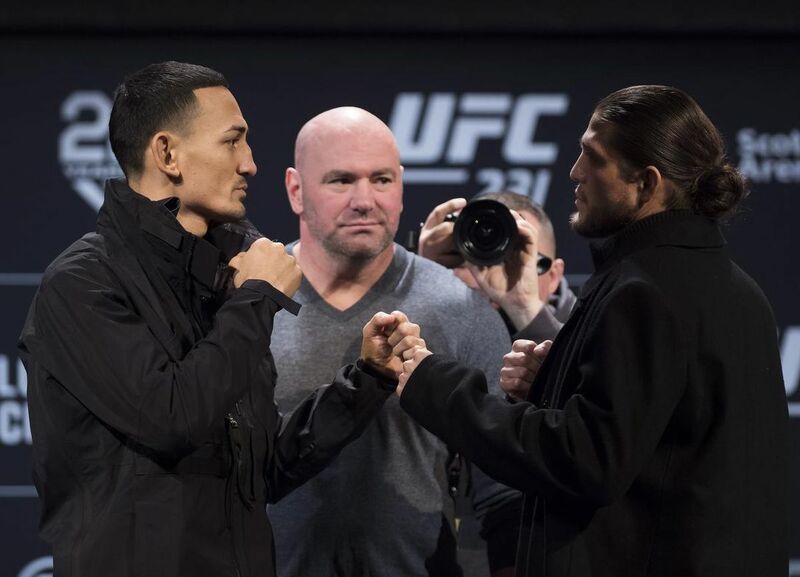 UFC featherweight champion Max (Blessed) Holloway took aim at rival Brian (T-City) Ortega on Wednesday, saying the challenger lacks his credentials. “He’s good, he’s a dangerous man,” the 27-year-old Hawaiian told the UFC 231 pre-fight news conference. “Everybody’s keeps talking about Brian and this and that. (But) everything the guy did I did better. “Someone is still delirious,” replied Ortega in what seemed a reference to Holloway’s health issues earlier this year. The exchange was one of the few barbed moments of the news conference at the Winter Garden Theatre. Holloway, who has not fought since last December due to a series of ailments, presented UFC president Dana White with a red-and-white lei before sitting down next to his championship belt. “It’s good to be back here. I love this city,” said White, before going to questions. Ortega (14-0-0 with one no contest) arrived wearing a Burberry scarf, which the No. 1 contender from California elected to keep. An ankle injury had forced Holloway (19-3-0) out of a March bout against former lightweight champion Frankie Edgar at UFC 222. Ortega filled in for Holloway, winning by first-round TKO. That track record has Ortega wondering. “How sure are we (the fight will go on as scheduled)? I can’t answer that,” he said. But Ortega, later in the news conference, made a point of wishing Holloway well. Holloway has said he is fine now, although doctors don’t seem sure about exactly what was ailing him. Holloway feels good in Canada. He won the interim title two years ago in Toronto, beating former lightweight titleholder Pettis at UFC 206. And his first main event was in Saskatoon — a win over Charles Oliveira on a Fight Night card in August 2015. A Raptors fan, his one request in the buildup to the fight was that he get to see the Golden State Warriors when they played in Toronto last week. That led to photo-ops with Drake and Raptors general manager Bobby Webster, also a Hawaii native. He repeatedly called Toronto the 10th island at Wednesday’s news conference. Hawaii is made up of eight major islands. Holloway calls Las Vegas his ninth island and Toronto his 10th. The news conference also featured women’s flyweight contenders Joanna Jedrzejczyk (15-2-0) and Valentina (Bullet) Shevchenko (15-3-0), who meet for the vacant title in the co-main event at Scotiabank Arena on Saturday. “After my victory on Saturday, I will prove that I’m the GOAT of women’s MMA,” said Jedrzejczyk, referring to the greatest of all time. “There is no way that I will leave this city without the belt,” countered Shevchenko. Shevchenko, a native of Kyrgyzstan who fights out of Peru, beat Poland’s Jedrzejczyk three times a decade ago in Muay Thai competition. Jedrzejczyk won the strawweight (115-pound) title at UFC 185 in March 2015 and defended it five times before losing a pair of fights to current titleholder Rose (Thug) Namajunas. There are six Canadians on the 13-fight card, the first in Toronto in two years: Calgary featherweight (Mean) Hakeem Dawodu, Montreal lightweight Olivier (The Canadian Gangster) Aubin-Mercier, Toronto middleweight Elias (The Spartan) Theodorou, Winnipeg bantamweight Brad (Superman) Katona, welterweight Chad (The Disciple) Laprise of Chatham, and lightweight Jesse (The Bodysnatcher) Ronson of London.